From the Forums: Circuit Playground Express controls vintage sound chip via CircuitPython #CircuitPlaygroundExpress #CircuitPython #FromTheForums #Adafruit #VintageComputing #Arcade @Adafruit @kevinjwalters « Adafruit Industries – Makers, hackers, artists, designers and engineers! A quick test of the Adafruit Circuit Playground Express (CPX) board running CircuitPython controlling an AY-3-8912A/P sound chip via an SN74HC595 shift register with audio output through a passive mixer circuit. The AY-3-8910 is a 3-voice programmable sound generator (PSG) designed by General Instrument in 1978, initially for use with their 16-bit CP1610 or one of the PIC1650 series of 8-bit microcomputers. The AY-3-8910 and its variants were used in many arcade games—Konami Gyruss contains five—and pinball machines as well as being the sound chip in the Intellivision and Vectrex video game consoles, and the Amstrad CPC, Oric-1, Colour Genie, Elektor TV Games Computer, MSX, and later ZX Spectrum home computers. It was also used in the Mockingboard and Cricket sound cards for the Apple II and the Speech/Sound Cartridge for the TRS-80 Color Computer. After General Instrument’s spin off of Microchip Technology in 1987, the chip was sold for a few years under the Microchip brand instead. It was also produced under license by Yamaha (with minor modifications, i.e. a selectable clock divider pin, and a double-resolution but double-rate volume envelope table) as the YM2149F; the Atari ST uses this version. It produced very similar results to the Texas Instruments SN76489 and was on the market for a similar period. 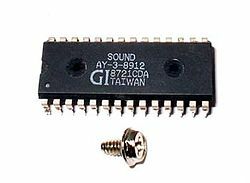 The AY-3-8912 is the same chip in a 28-pin package, with parallel port B simply not connected to any pins. Smaller packages save cost and board space. The 8912 was the most widely used variant. The chips are no longer made, but functionally-identical clones are still in active production. An unofficial VHDL description is freely available for use with FPGAs.